Between Chazelle and Cluny there are three different road signs, all three referring to something Romanesque. One of those signs refers to the village of Lournand. After the quest for the Romanesque church of Massilly (see the previous blog) I decided that I could crack this one as well. Both churches, that of Massilly as wel as that of Lournand look from a distance very similar, and could have been built, as far as I could guess, in roughly the same period. 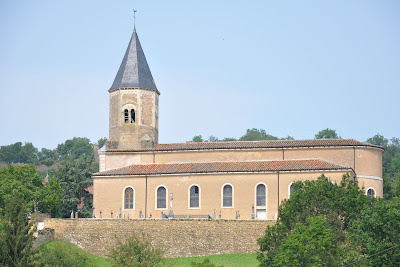 On le site sur l'Art Roman en Bourgogne I found under the 1 or 2 star churches for Lournand a former church Saint-Hubert, no pictures available. The pictures item could be solved easily. On a fine day we drove into Lournand. The church is prominently present, and inside the church, which was obviously still in use, I found a pamphlet telling something about the history of the church. The church had been completely rebuilt in the 19th century (which confirmed my guess), but the crossing, i.e. the base of the bell tower, was the only remaining part of the original, 11th century Romanesque church. The plot thickened even further, because not only was this NOT a former church, it was also dedicated to Sainte-Marie, not to Saint-Hubert. "Completeness is difficult to achieve, but certainly my goal. All acknowledged Romanesque churches of the calibre of Chazelle (hence 3 stars or more) are mentioned on my site. The lists of 1 or 2 star churches are most likely not 100 % complete (a church containing a Romanesque part of a wall already qualifies for an entry), but are certainly as complete as possible." Eduard was obviously not aware of this church, since it certainly contained something Romanesque. I had all of a sudden a new riddle to solve: where was the former church Saint-Hubert? Knowing Eduard a bit better by now I hoped to be able to crack this mystery soon. However, the Lournand story was not over yet. When we left the church we saw a vague acquaintance sitting on a balcony of the house opposite the church. We knew she lived in Lournand, but we never knew where. She asked us in, and after some chitchat she told us that the other side of her house had a beautiful view on the château. 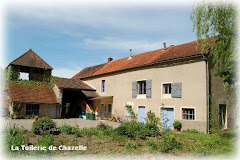 A château in Lournand? Never heard of! 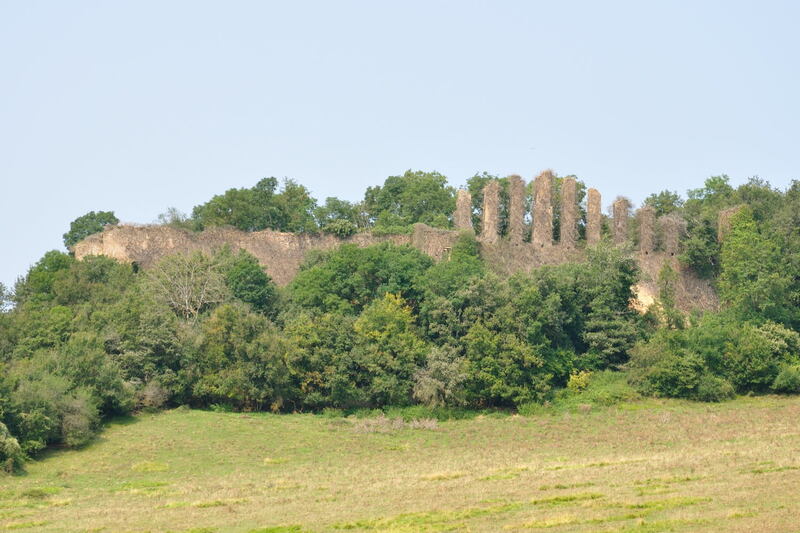 And indeed, one of her rooms had a nice view, it looked out over a ruin, possibly of an old fortress. However, it could also have been the remains of an old factory. What we saw was a very long bit of wall from which 9 pieces of walls were protruding like raised fingers. After having said goodbye, we decided to leave the village via a different road. We were quite surprised to find all of a sudden a long part of a defence wall on the road side, with at a certain point a semicircular part of wall which well could have been a defence tower. As soon as we reached home I sent Eduard an email wit questions concerning the Sainte-Marie of Lournand and the Saint-Hubert. 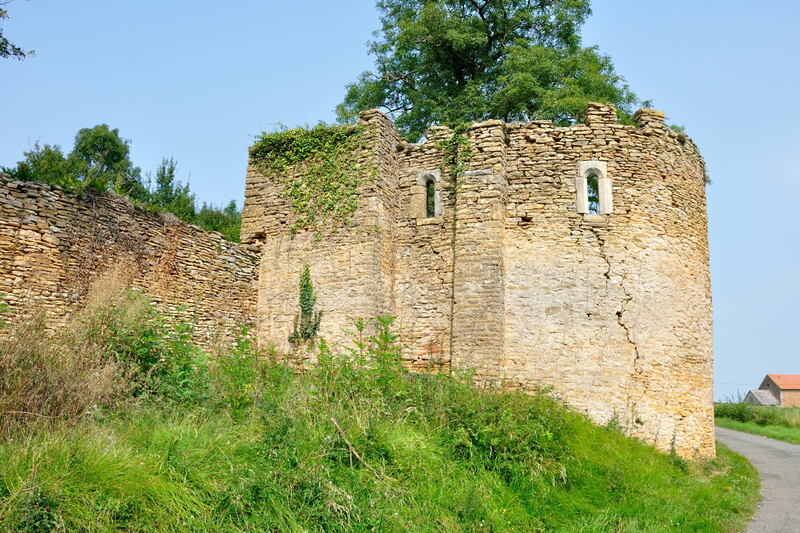 The answer came almost instantaneously with a photograph of the chapel Saint-Hubert; that turned out to be the piece of wall I had assumed to be a tower. Looking back now, this seemed to be a comedy of errors. I thought Eduard had made a mistake in the name of the church, and Eduard thought that Lournand church had nothing Romanesque. Who will maintain, after reading this story, that coincidence does not exist? For our own website click here. When we go to Cluny, and that happens at least twice a week, we always pass through the village of Massilly. 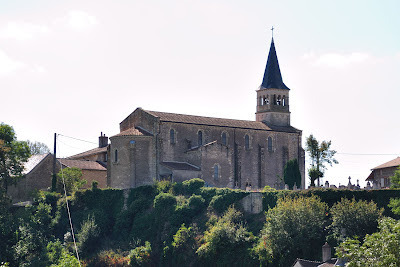 And every time we pass the main street there, we see a sign saying "Eglise romane". The church is perched on a hill top, and when we climbed up there to have a look at this church, we were not really impressed, to say the least. But what is printed in black and white must be true, so this was obviously a very boring, uninteresting, Romanesque church. Because there was no mention of this village and church on le site sur l'Art Roman en Bourgogne, and because I did not want to be told that I had it wrong again (! ), I searched the internet for more information. The church goes back to 1856, and was built near the demolished, most likely Romanesque Saint-Denis. 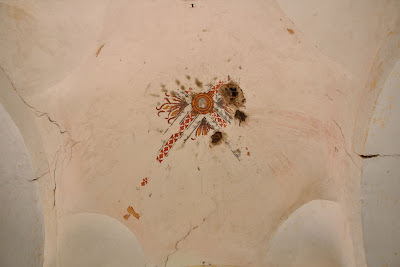 However, this did not exactly solve the mystery of the sign "Eglise romane". A couple of weeks after the discovery of the birth date of the church, and after passing the sign along the road for the 200142-nd time, all of a sudden a penny dropped. 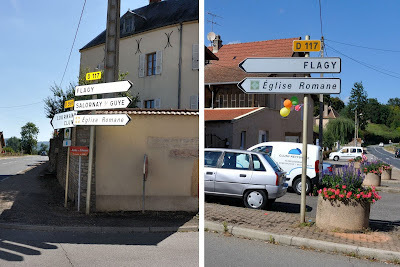 On one side of the road there were three signs : “Flagy”, “Salornay / Guye” and “Eglise Romane”. On the other side there were two : “Flagy” and “Eglise Romane”. The sign obviously did not refer to the church of Massilly at all; most likely it was referring to the church in the nearby village of Flagy! And Flagy was certainly mentioned on Eduard's unsurpassed list of Romanesque churches, albeit without pictures. 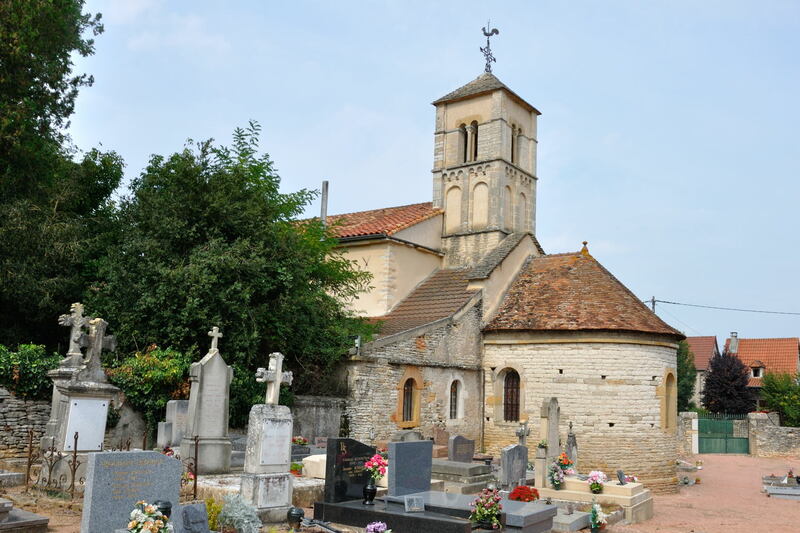 The next time we came back from a shopping spree in Cluny we turned off at Massilly and followed the signs to Flagy, and bingo, that is where we found a cute Romanesque church. In the meantime Eduard has incorporated some of my pictures on his web page for Flagy. For some more pictures of the church of Flagy, click here.